Charting this market has been an exercise in patience lately. Remember way back in August when wave iv was obviously a triangle? And then it wasn't. Remember the head and shoulders pattern that whipsawed? TWICE? WTF is This Crap? Pattern: This pattern occasionally shows up as a consolidation after a mini-crash. It is recognizable by the fact that it is largely indistinguishable from utter chaos. The main defining characteristics of this pattern are that it trades within a broad range, and all other patterns formed within the WTF is This Crap? Pattern are utterly meaningless and will ultimately fail. If you find yourself staring at a chart for hours, after which you finally remark, "WTF is this crap?" you have probably just come into contact with this pattern. Ha ha, just a little Technical Analysis humor there, designed to elicit angry responses from everyone. Anyway, on to what I may have actually uncovered after staring at the charts for literally hours today and saying to myself, "WTF is this crap?!" 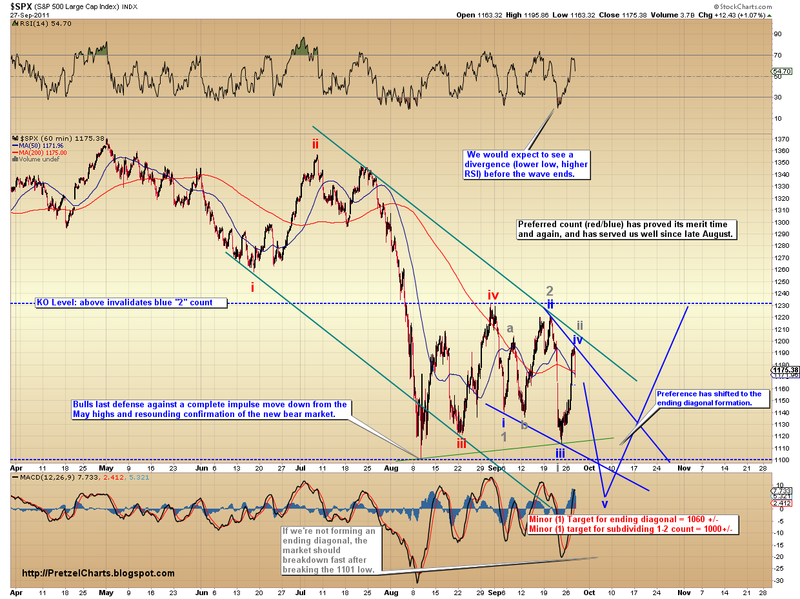 The SPX is truly a challenge to count right now. It looks likely that we made the newest top to the straight up/straight down moves that have defined the range since the 1101 low, because yesterday's move down appears impulsive -- which means it should continue lower after a bounce or two. It also looks reasonable to assume that the market will form the ending diagonal we hypothesized previously. 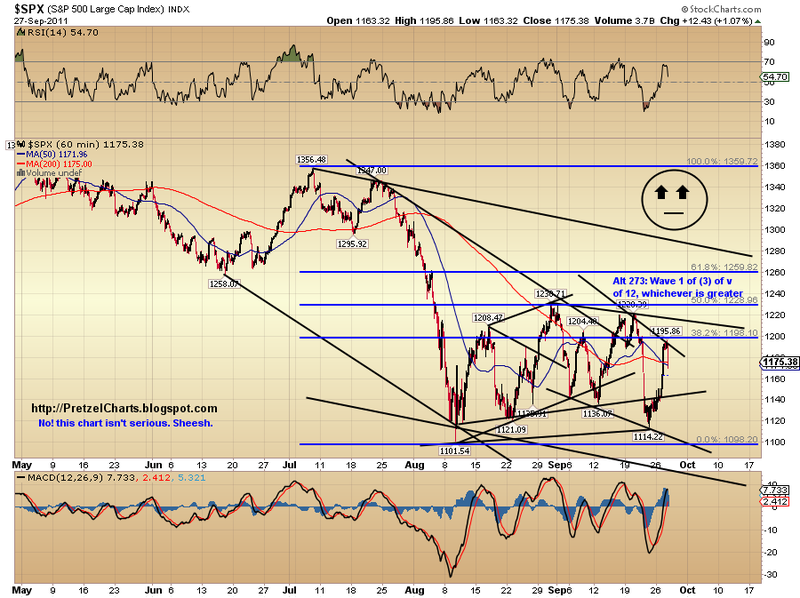 But it's a very garbled pattern since the 1101 low. So after staring at a multitude of SPX charts in various timeframes for an hour or two, I finally said to myself, "Screw this." And I went and charted the Wilshire, Dow, and NYA. Unfortunately, the other indices aren't crystal clear either. 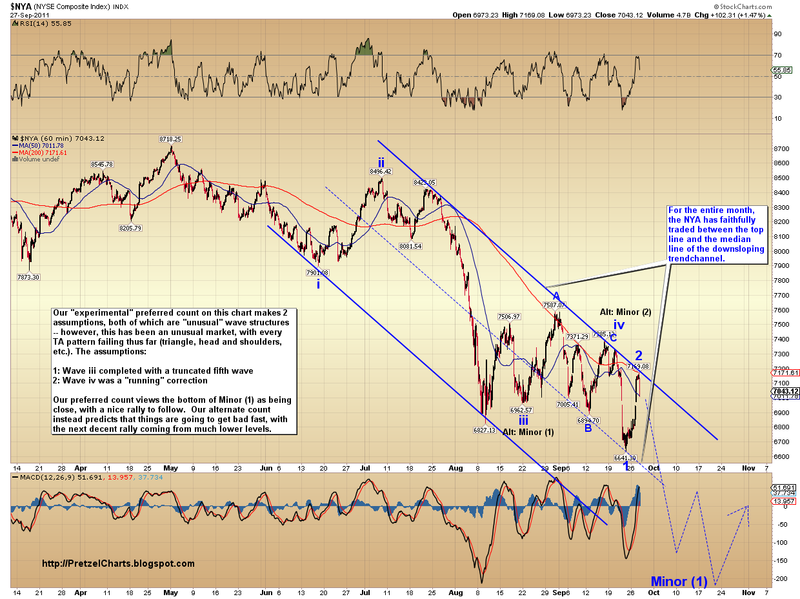 The Dow and NYA both made new lows last week, while the SPX and Wilshire haven't. I decided to focus on the NYA to check for possible alternates. 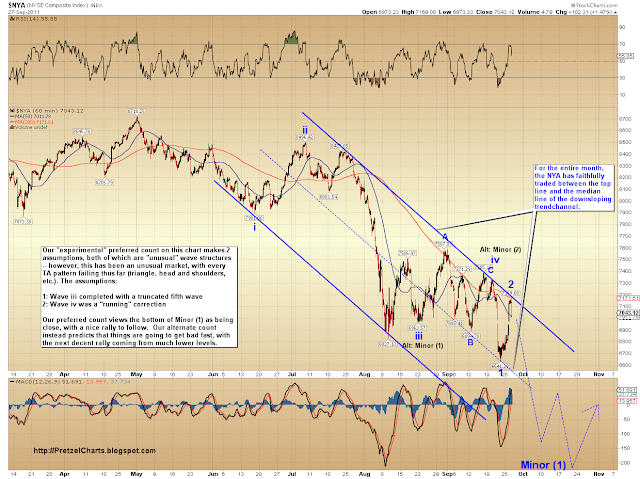 The first interesting note is the way the NYA has honored the down-sloping trendchannel. It has traded almost perfectly within its channel, and for the entire month has bounced between the top line of the channel and the median line. I decided to try an "experimental" count to reconcile the NYA as a way to search for other potentials. I call the count experimental because it requires the use of two unusual waveforms (infrequent patterns) to fill in the blanks. However, this market has been nothing if not unusual (consider the failed technical patterns of the triangle and h/s), so perhaps unusual waveforms are appropriate. The bottom line is: I would give a 70% probability to the ending diagonal... but there are definitely other possibilities, which should be clarified in the next few sessions. 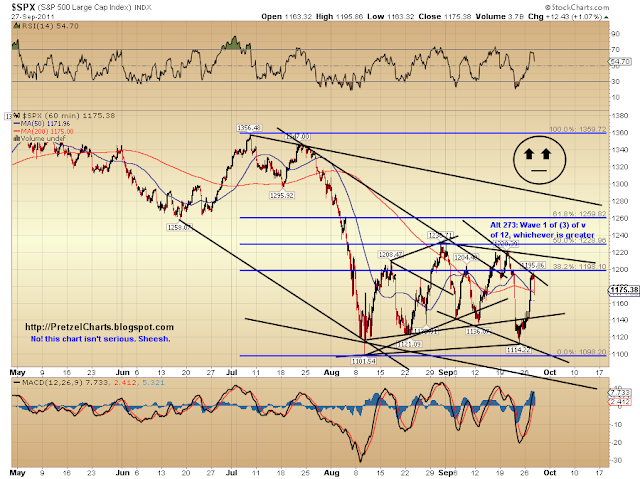 I've posted the SPX chart to reflect the preferred view that an ending diagonal is forming. I've labeled an alternate count, but the wave formations on the labeled alternate count would be appropriate only if the market is gearing up for a big, swift move down of 20% or more. So the alternate labeling becomes hard to justify in the context of wave v of Minor (1). 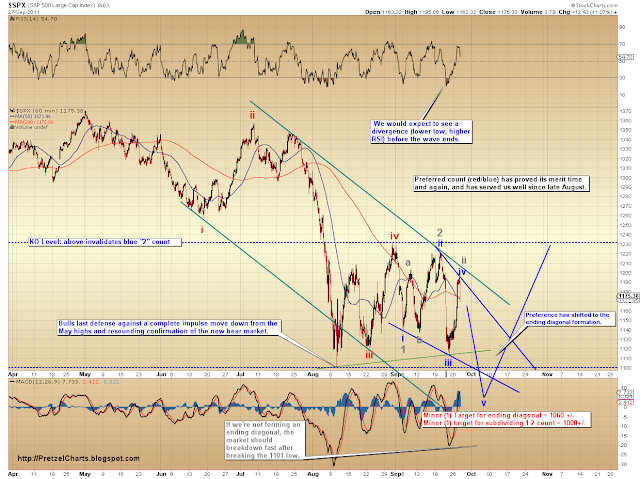 Wave v could support a swift move down, but it's unlikely to be a move much greater than 10%. The big move becomes possible to justify if what we're seeing isn't part of Minor (1) at all, but is instead Minor (3) down beginning to unfold -- so I've labeled that as an alternate on the NYA chart. On the NYA chart, I've posted the "experimental" wave labels, which don't violate any rules, but do take a bit of creative license with the structure. The alternate count on the NYA chart says we've seen Minor (1) AND Minor (2) up already, and we are now starting Minor (3) down. Minor (3) will knock 20% or more off the indices, so that would make far more sense in terms of viewing the recent waves as a 1-2 structure. We'll have our answer in the next few sessions. Sorry if your head wants to explode after looking at the alternate counts. If your head actually DOES explode, you'll have an idea of how I felt earlier this evening. But don't worry too much about the alternates right now; instead keep your eye peeled for the ending diagonal, as that seems most likely, and should spark a multi-month rally. Trade safe!